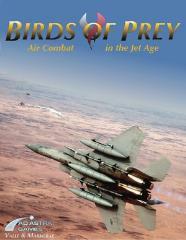 Birds of Prey is a revolutionary game of dogfighting in the jet age. Air combat is the ultimate three-dimensional environment and Birds of Prey captures that three-dimensionality like no game before. With a consistent flight model that doesn't care whether you're turning in the horizontal or in the vertical ("looping"), Birds of Prey avoids the rafts of special rules that made other air combat games difficult to learn and prone to player error. The core of Birds of Prey is the PHAD the Pitch, Heading, and Attitude Display. Those of you familiar with Attack Vector: Tactical or Saganami Island Tactical Simulator will recognize the PHAD as the predecessor of the AVID from those games. This simple tool not only allows players to track their the orientations of their aircraft in three dimensions, it also makes it simple to take bearings in three dimensions. Similarly, the PHAD makes figuring blind spots (where you can't sight other aircraft) a trivial exercise, regardless of whether the aircraft is flying straight and level, has its nose pointing straight up, or is in the middle of a wingover.